Bus Riders- Once the bus arrives at C. Ray, students will leave the bus and meet with the rest of the class in the cafeteria for breakfast. Parent Drop-Off- If you are dropping your child off at C. Ray, please pull or park your car in the John Bishop Memorial Park parking lot, marked with the red P. Your child will enter through the Purple Star door; you may walk them up or watch them walk to the door from the parking lot (walking them up is strongly encouraged). If you are dropping your child off at C. Ray and need to come inside, please park in the red lot so that you can first check in at the office. If you are picking your child up at C. Ray, you will need to park in the parking lot of the John Bishop Memorial Park, where the red P is on the diagram. You will then walk to the back door of C. Ray (Purple Star), where your child and teacher will be waiting for you; your child will not be passed off until eye contact is made between you and Ms. Drake. If your child is getting on the bus, they will leave the building and load the buses near the doors of the green star. If you need to come inside the building for any reason, during the day, you may park in the parking lot between C. Ray and Kae Ave. (red block) and come in from the front. Remember to check in at the school office. 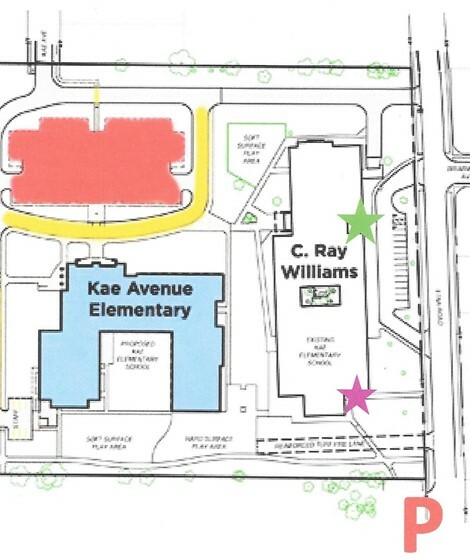 Please be aware that there is a drop off/pick up zone in front of Kae and C. Ray Williams. This is for Kae Avenue Elementary ONLY. Do not drop off or pick up C. Ray Student from this location (Yellow loop on map). Bus Riders- Only preschool children with disabilities ride the bus. The bus aide loads the children from their designated stops and an educational aide meets and escorts child to classroom. All preschool children being dropped off or picked up from the center must have a designated person that is authorized to sign them in or out. This person must park in red lot and use crosswalk at Kae Avenue Elementary to access building. Do not park in fire lane this is for Kae Avenue Elementary. You may be ticketed. The Etna Road Doors (Green Star) are not accessible during school day. Do not park in Etna Road parking lot. This is for bus drop off and parking for unified arts teachers who will be traveling from their home schools to deliver, Music, Art and Physical Education to the Kindergarten Students.